PERIOD OF RECORD.--Discharge records from April 1940 to current year. REVISED RECORDS.--WSP 1438: Drainage area. WSP 1508: 1943 (P). WDR-US-2007: Location. GAGE.--Water-stage recorder. Datum of gage is 762.52 ft above National Geodetic Vertical Datum of 1929. Prior to October 1, 1951, water-stage recorder upstream from Scott Street Dam (0.4 mi upstream from current site) at datum 11.16 ft higher; October 1, 1951, to September 30, 1953, water-stage recorder at Southeast 14th Street (0.5 mi downstream from current site) at current datum; October 1, 1953, to September 30, 1959, water-stage recorder upstream from Scott Street Dam at datum 11.16 ft higher; October 1, 1959, to September 30, 1961, non-recording gage at current site and datum; October 1, 1961, to April 24, 1997, water-stage recorder at Southeast 14th Street at current datum. COOPERATION.--Average monthly pumpage from galleries provided by Des Moines Water Works. 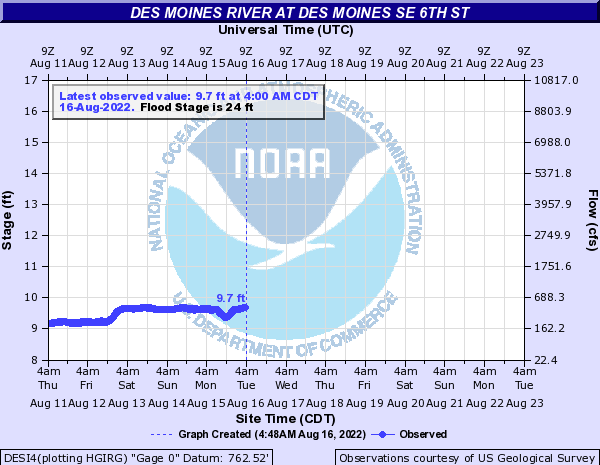 REMARKS.--Des Moines municipal water supply is taken from infiltration galleries on Raccoon River, 3.5 mi upstream from station. At times, water is pumped from Raccoon River into recharge basins or into Des Moines Water Works reservoir, capacity 4,800 acre-ft. Effluent from sewage treatment plant enters the river 2.3 mi downstream from station. Net effect of diversions not known. Flow regulated by Saylorville Lake (station 05481630), 12.7 mi upstream, since April 12, 1977. PERIOD OF RECORD.--Water years 1945-1947, 2008, 2009-2010, 2012. WATER TEMPERATURE: Daily instantaneous values collected in conjunction with suspended-sediment samples, October 1944 to September 1945, records fragmentary. SUSPENDED-SEDIMENT CONCENTRATION AND DISCHARGE: October 1944 to September 1947.